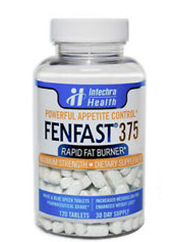 ﻿ Fenfast 375 Pills: Is it Safe? Due to the similarly looking appearance to the prescription drug Phentermine, these blue and white pills have offered a prescription less weight loss supplement which has been reviewed by many customers. However this marketing strategy although clever, is not enough to satisfy a valued exchange of your hard earned money. This breakdown simplifies thedetails so you can accurately judge for yourself if the quality ranks with these top rated supplements..
Just 4 ingredients make up this supplement which is intended to do a plethora of positive things to increase weight loss possibilities. The intention is to increase metabolism and energy, decrease hunger and fat, and to improve overall mood and mental focus. Found here is a form of dehydrated caffeine named 1,3,7-trimethylxanthine which is meant to increase metabolism and energy. However there is no mention as to how much is inside which is important to know as too much caffeine for anyone can lead to a series of harmful potential side effects. Theanine which comes from green tea is also added which essentially has a calming effect without making one sleepy. Hordenine is intended to burn fat however not enough research is available to really make this claim. Finally there is Phenylethylamine added which is intended to do several things including increase mood and control hunger. However the studies have shown that this extract when introduced into the body is rapidly degraded, meaning it does not have an effect when taken in supplement form. So far it seems only caffeine is really the star of the show, as it has been proven to work. However without knowing the exact amount it is too much of a gamble. Making the proper choice for a supplement has been simplified into easy to read lists. Price is reduced if you buy in bulk. Also available through the retailer. There are far too many negative customer experiences noted and no listing is available of the supplement facts. There is a fascinating claim made that this brand will allow you to lose a lot of weight in just a single month. This is made without any evidence to show. Seeing as how caffeine is the only real ingredient studied enough to guarantee results it makes sense why there is a host of potential side effects. Customers have noted a potential swing towards anxiety, vomiting, nausea, headaches, dehydration, rapid heart rate and mood swings to name a few. Although the product has been used by many, this might be due to the marketing which makes it appear to look like a popular prescription weight loss drug. The addition of ingredients is not listed in full which is a shame as one has to know the rate of caffeine and other additives to make sure you get what is needed. There are more wholesome options available for you to choose. It is worth mentioning there was some good reviews left on review sites. In order for you to make the decision for your best results, take a gander at the highly approved customer favorites available now.